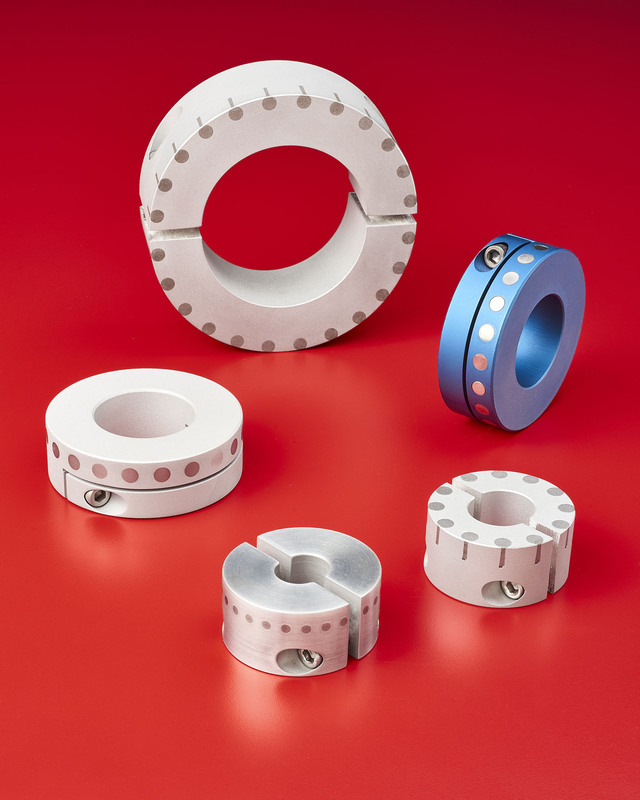 A line of rotary encoder shaft collars that provide targets to let variable reluctance sensors track the speed of rotating shafts or axles is available from Stafford Manufacturing Corp. of Wilmington, Massachusetts. Stafford Rotary Encoder Collars are aluminum shaft collars that feature steel or magnetic targets permanently affixed to their face and/or O.D. to let variable reluctance sensors track the speed of rotating shafts or axles. Designed for new and retrofit applications, standard and custom designs are offered to add rotational speed sensing on shafts from 1/2” to 10” I.D. Available in one- and two-piece styles, Stafford Rotary Encoder Collars can incorporate a wide range of target patterns. To match existing shafts, the bores can be round, square, hexagonal, or threaded. Unaffected by oils and coolants, the collars can be anodized in various colors to match equipment. Stafford Rotary Encoder Collars are offered as a standard product line priced according to size and quantity. Specials are quoted upon request.